Remember my Wishlist 2011 post from December? 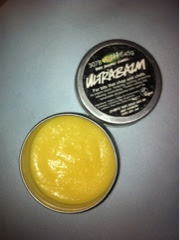 One of the products listed was the Lush Ultrabalm, that I later recieved as part of my 'not-so-secret' santa gift. After a good two months of using the balm, I think it's time to write about my experience with it. First thing I should tell you is that I have eczema, which is basically a non-contagious skin condition that varies in symptoms according to the individual. In my case, I get patches of really dry and flaky skin which used to be on my face (near my eyes) when I was younger, but is now around my ears and hairline (I have no idea why/how it's moved). I've tried a bunch of products, from E45 to prescribed creams and lotions (that I don't remember the names of). Before Lush Ultrabalm, I was using the Body Shop Hemp Balm (mini review here) and wanted to try something new once that had been used up. I was going to purchase Lush Ultrabalm, but my friend beat me to it! Lush Ultrabalm is packaged in an almost identical way to the Body Shop Hemp Balm, in a tin tub with a screw on lid. Because the product can become quite greasy, it's a lot easier to take some out of a tub rather than squeeze a tube, so I do like the packaging because it is practical (and easy to store). The balm itself is a lot softer than the Body Shop Hemp Balm, which makes it easier to use, as I don't have to spend ages trying to warm it up for it to come out of the tub. I love products that smell good but unlike the rest of Lush's products, the Lush Ultrabalm doesn't have a particularly nice smell, even though it is supposed to be unscented (maybe it's just the natural scent? ), however it is not as strong as the Body Shop Hemp Balm, which I definitely did not like. Lush Ultrabalm is definitely working a lot better at reducing the eczema that I have around my ears. Since I've started using it, the patches of eczema have reduced and I'm not having to continuously itch behind and around my ears (which is actually quite hard to do through my hijab!). I also use the ultrabalm on other patches of dry skin especially on my feet (although I prefer to do this at night before I go to sleep). Lush UIltrabalm works out as more expensive out of the two (for the same amount of product, 45g) although considering that the ingredients in Lush Ultrabalm (there are only three!) are all natural and vegan friendly I wouldn't mind paying the extra amount. great post. How often do you have to apply? MY friend has really bad eczema so maybe I can get this for her one day.